Amy Johnson served as Project Director for the Heritage Grant project, “Germans and Latinos of Lenawee: Finding Home”, from June 2015-June 2016, sponsored by the Lenawee County Historical Society of Adrian, Michigan. As an undergrad at Adrian College, Johnson was an intern at the Lenawee County Historical Museum, where she studied the Latino history of Lenawee County, and expanded on the Latino exhibit held at the Museum. She has a Bachelor of Arts in History and a Minor in Sociology, focusing on Anthropology. At the opening day event for this project in April 2016, two visitors found themselves studying the same photograph in the Museum’s German exhibit. After exchanging a few words, they realized they were related. They had not met previously, but had one photographed relative in common. This relationship, among others, was made possible because of the experience of opening day and the success of the grant project. Happenings such as this serve as proof that we need to know history to understand the present. The cultures that make up our world are vastly different, and at times considered strange. Culture is the backbone to each historical event, and it should be a priority to educate on the background of different cultures, and to examine the contributions individuals of those cultures gave to society. The project expanded and promoted deeper understanding of the two major ethnic groups in Lenawee: Germans and Latinos. The goal of the project was to focus on how German and Latino immigrants have impacted the county through the creation of enclaves in the larger community. 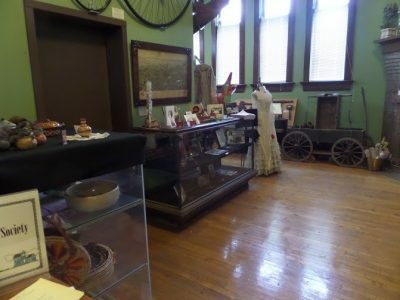 We expanded on and created more concrete German and Latino exhibits in the Lenawee County Historical Museum. The project incorporated the authentic voices of German and Latino families in Lenawee through oral histories. 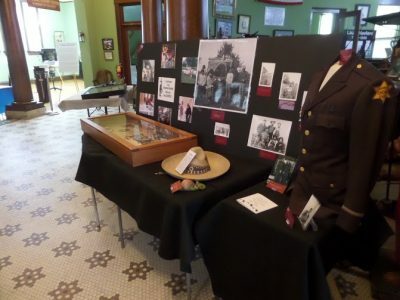 The interviews were shown in the exhibits as a way to view the past through the story telling of Lenawee’s local citizens. Short story booklets were made available for visitors to read through as they studied the Living Museum’s artifacts showcasing hardship and success of Lenawee’s Germans and Latinos. Ultimately, we hoped the project would encourage others to strive for a fair representation of its German and Latino populations, and that Lenawee citizens would appreciate the contributions of all ethnic groups as a result. 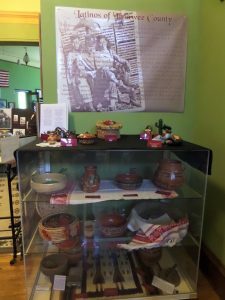 The Latino portion of the living museum showcased images of Lenawee’s migrant worker strike. Images of picketing and Latino camaraderie filled the board. Next to those images sat a donated jacket of a retired Latino Lenawee County Deputy. The story of strike, racism, and hardship were transformed into Latino success in one exhibit. It was considered shocking and unheard of that a Latino person would ever amount to a significant position in society. Showing these events side by side opened people’s eyes to the amazing success and contributions of a group that has been that a highly discriminated against in Lenawee County. The German portion of the living museum showcased the Prisoners of War camp that was located in Blissfield, Michigan. Many German POW’s remained in Lenawee following their time in the camp. They acquired a stigma, while both in and out of the camp, as believers and partakers in Nazi ideals. Next to those images were photos of German families, German farm houses, and German based establishments–all in Lenawee. 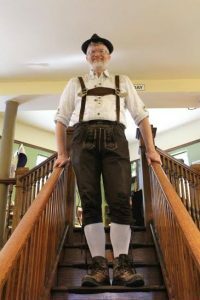 Germans considered Lenawee a home that was fit for their growing families, and their financial and educational needs. They respected American ideals and taught their children to value those ideals.